This book provides a review of novel pharmaceutical approaches for Tuberculosis drugs. It presents a novel perspective on tuberculosis prevention and treatment and considers the nature of disease, immunological responses, vaccine and drug delivery, disposition and response. 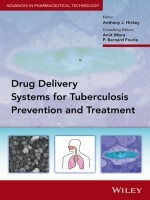 Delivery Systems for Tuberculosis: Prevent and Treatment has a multidisciplinary appeal, with contributions from microbiology, immunology, molecular biology, pharmaceutics, pharmacokinetics, chemical and mechanical engineering. This book is all set to be launched in the month of September this year and is augured to be a best-selling product due to its versatility and involvement in multifarious disciplines with pertinence to delivery systems, prevention as well as treatment.